The first consideration is the unspoken hierarchy of nursing specialties and how this needs to be challenged. Secondary care is not more prestigious than other sectors and yet we constantly see a culture that promotes earning your stripes in hospitals before working in the community or elsewhere. This is one reason why primary care nursing, for example, has been brought to the brink of extinction. Anecdotally, I have heard that universities and hospitals signpost newly qualified nurses straight into secondary care nursing. This has to stop. I would like to reverse the thinking that enhanced clinical skills are where it is at, because we need to understand the complex relationship between well-being, families and communities before we nurse people in institutions. Understanding the social aspect of health, what keeps people well – which, according to research evidence, is about social connectedness and not just about helping them to stop smoking or unblocking their coronary arteries – is surely a foundation for a career in nursing. The perception of social care must be challenged next. Nurses and healthcare assistants need to challenge the view of social care as a low-wage, low-skill occupation. In other cultures older people are given respect and enabled to contribute actively to society for as long as possible. 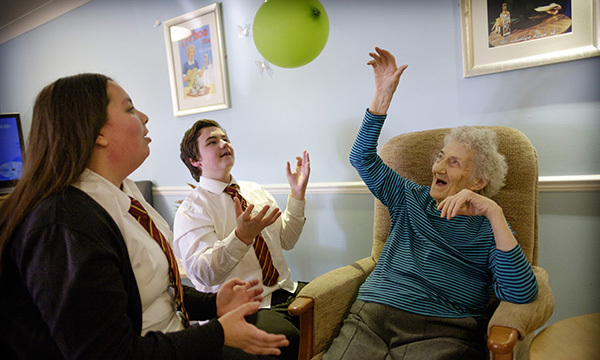 We see UK experiments in residential homes where children help older people to stay active and emotionally well, facilitated by physiotherapists. Nurses can be in the vanguard of such initiatives. Many surely are, but they are not visible in the general image of nursing. Social care leaders have told me that the NHS as a whole is way behind local government and housing in terms of chapter two of NHS England’s Five Year Forward View – how we can harness the ‘renewable energy’ of people and communities. The tenor of HEE’s latest workforce document continues a tradition of 70 years of delivering services to and for people. I call this the ‘angel syndrome’, where health and social care staff are the solution. This is another area that demands open debate within the professions. Where the presenting problem is acutely clinical, then caring for people is appropriate. When the presenting problem has a social component, then it is about co-producing sustainable solutions, with nurses and multi-agency teams asking for people’s advice on how to solve problems rather than seeing them just as ‘in need’. The important role of a nurse as an enabler of solutions is understood but not sufficiently shouted about in certain nursing disciplines, such as learning disability nursing, health visiting and school nursing. Disciplines come under threat when the link to robust clinical outcomes is harder to establish. Workforce planning in 2018 needs new paradigms: about understanding wellness, not just illness, and about harnessing the assets beyond health and social care.